But so you don’t look like a complete idiot you should really cook your food on a BBQ. Here at On The Gas we have done a bit of research and come up with our top 5/6 BBQ Grill Smokers so you can roast, grill, smoke and burn things to your hearts content. A massive chunky beast which will dominate its space in your back yard let alone make all other BBQ Grill Smokers look like kids toys. It has a huge 40×20 inch grill and the 20×20 inch smoker is big enough to crawl inside of if you get cold. This is the BBQ Grill Smoker for the small patio garden. It has all the same greatness as its Jumbo cousin, but it’s compact. 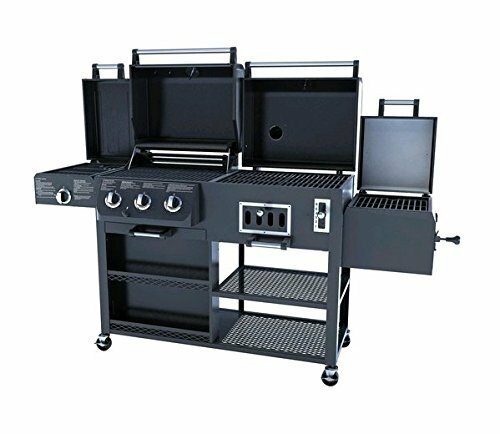 This dual charcoal and gas griller falls at the affordable end of the price range of BBQ Grill Smokers. This model is for the person who can’t wait to try his hand at everything. Smoking meats and fish is good fun, not to mention delicious. 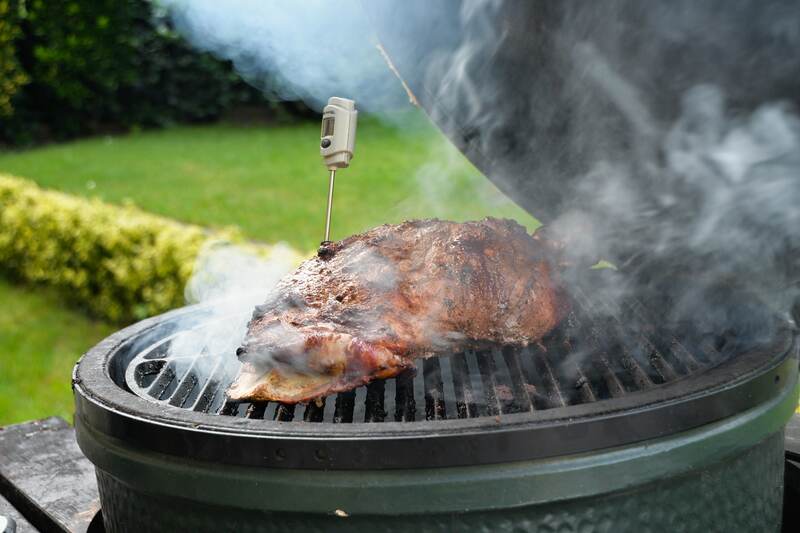 It easily reaches and maintains high temperatures, perfect for a good smoker, and you have a broad choice of cooking methods: smoke, indirect heat or grill. 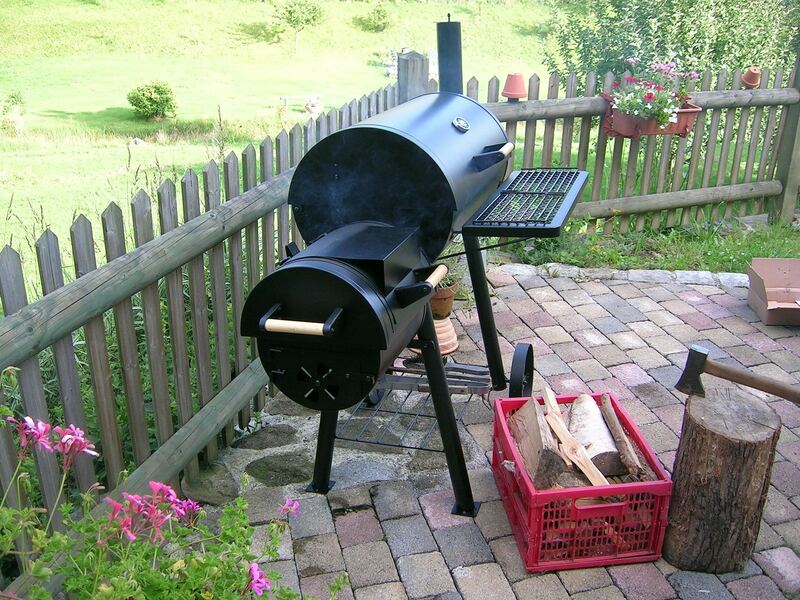 The Smoke Hollow 4-in-1 LP Gas Charcoal Smoker Searing BBQ comes with great customer reviews. 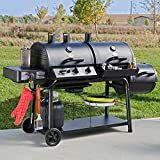 As you would imagine this jumbo BBQ Grill Smoker is a massive chunky beast which will dominate its space in your back yard let alone make all other BBQ Grill Smokers look like kids toys. Seriously this unit has it all – you are well and truly smokin. It is made with top-quality, durable materials, and you can take the afternoon to put it all together aided by the instructions (seriously who reads instructions), a box of beer and a few friends. Best price is on Amazon, shipping included. 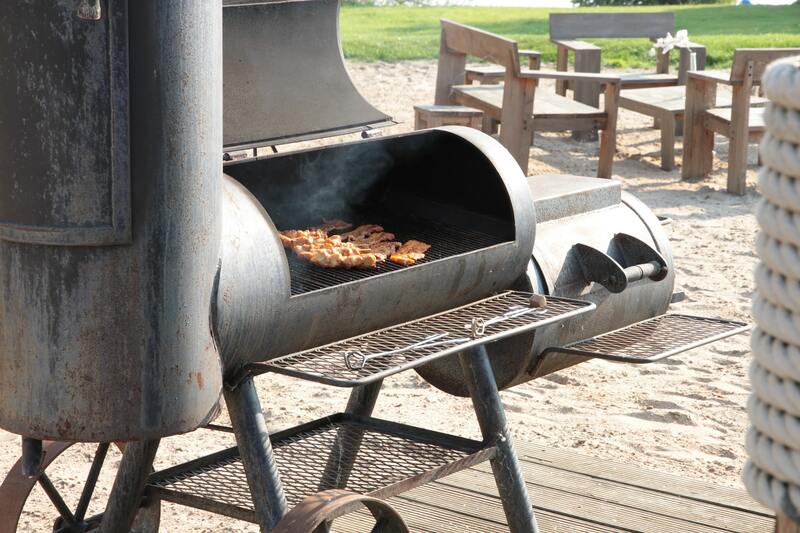 The Medina River Outdoors 67 is a high-end, jumbo grill/smoker combo with great customer reviews. 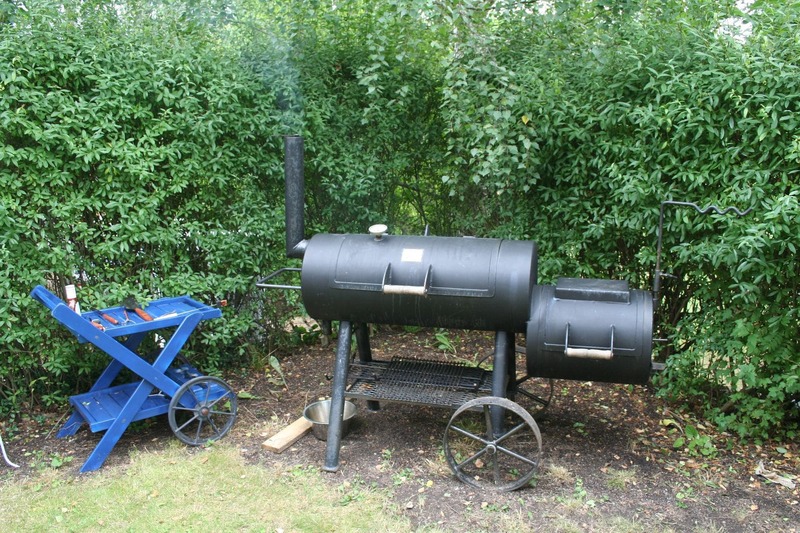 As you would imagine this jumbo BBQ Grill Smoker is a massive chunky beast which will dominate its space in your back yard let alone make all other BBQ Grill Smokers look like kids toys. It has a huge 40×20 inch grill and the 20×20 inch smoker is big enough to crawl inside of if you get cold. It is made with top-quality, durable materials, and you can take the afternoon to put it all together aided by the instructions (seriously who reads instructions), a box of beer and a few friends. Best price is on Amazon, shipping included. If you liked the sound of the Medina River 67 Jumbo, but let out a sigh of longing after you read it because that giant would never squeeze into your shoebox garden, then check out the Medina River Outdoors 65 or the Medina River Outdoors 60. This is the BBQ Grill Smoker for the small patio garden. It has all the same greatness as its Jumbo cousin, but it’s compact. Who said size matters? This sturdy piece of hardware will happily impress a group of your closest friends. 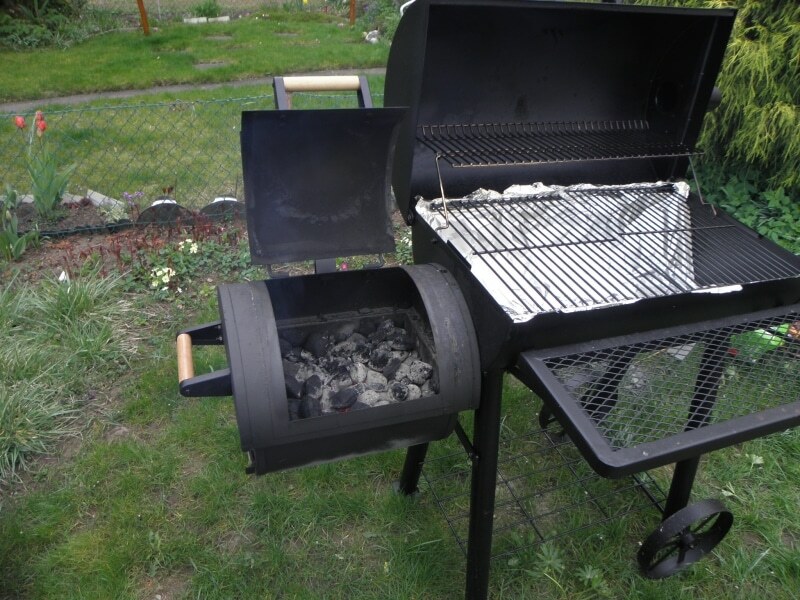 This dual charcoal and gas griller falls at the affordable end of the price range of BBQ Grill Smokers. For quick every-day outdoor grills, cooking is as easy as turning on the gas. If you want to have a more authentic BBQ experience, the charcoal option gives you that satisfying char-grilled taste and leaves you plenty of time to kick back with a beer while you wait for dinner to be served. The Char-Griller Duo is a great starter kit for someone exploring the idea of a permanent outdoor kitchen. To discover the joys of gas and charcoal combined. The Char-Griller Trio incorporates a smoker alongside the gas and charcoal grills of the 5050 Char- Griller Duo. It significantly broadens your cooking options too – so bring on those fancy recipes, you’ll make them look easy. You can get this Trio Combo from Amazon, shipping included. The Landmann 590135 Black Dog satisfies two hobbies for the outdoor man: BBQing and tinkering with gadgets. This is the dream BBQ Grill Smoker for the kind of person who can’t resist making personal improvements on the manufacturer’s design. The Black Dog is a hefty piece of equipment (although still remarkably mobile), which can handle your tinkering. It easily reaches and maintains high temperatures, perfect for a good smoker, and you have a broad choice of cooking methods: smoke, indirect heat or grill. Who knew how much choice there could be?! The right BBQ Grill Smoker will call out to you, whether you want the best of the beasts or a compact grilling companion. When you’re working with this much heat, you need to know what you’re doing – but trust your instinct! Which Type Of Grill Is Best? Deciding between these grills can be tough, especially with all of the terminology that gets thrown around. If you’re not an expert chef, it can be really confusing to choose between gas and charcoal or understand how you’re supposed to use a smoker box. The biggest difference between the grills above is the availability of all of these cooking modes. In order to choose the correct model for your backyard, it’s important to understand the difference between all of the ways you can use your grill. There are purists out there that will tell you that you should do all of your backyard cooking with charcoal. They’re wrong. While there are certainly a number of advantages bestowed by using solid fuel to cook your meats, gas offers a number of advantages as well. In fact, it’s probably better for most households. Gas grills don’t actually get very hot, at least as far as cooking is concerned. 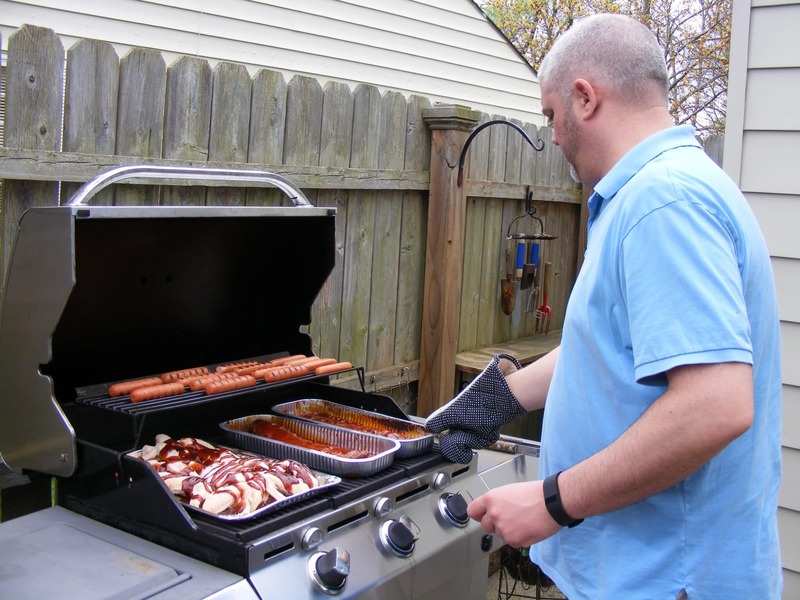 Your maximum temperature on most gas grills is going to be just over 500 degrees. This is more than adequate for almost all cooking you’ll do on your grill — you’ll seldom go over 300. Heck, the definition for barbeque is “slow cooking over low indirect heat.” You’ll often set your grill to no more than 220 F and let a choice cut of meat cook for hours. 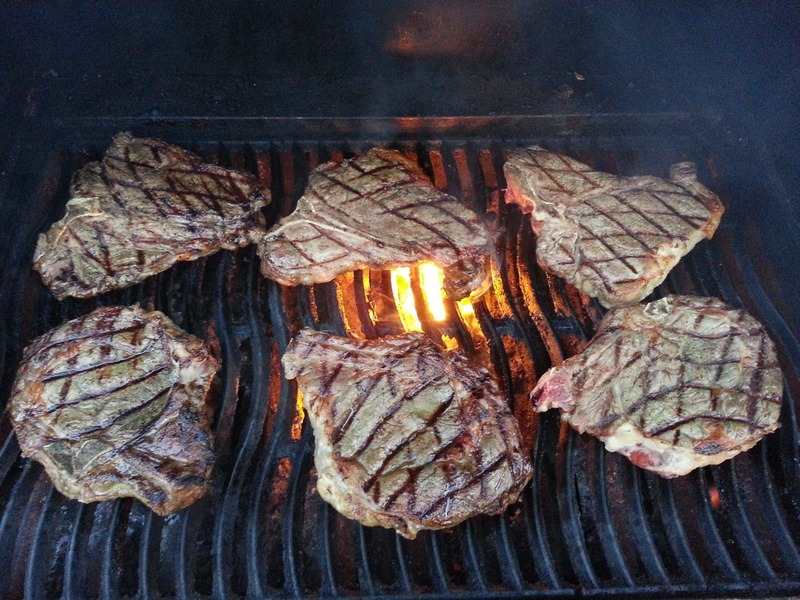 When it comes to searing meats, however, gas grills usually don’t cut it. Some speciality restaurant grills come with what are basically blowtorches right below the cooking racks in order to get the outside of a steak nice and crispy. None of the grills on our list have this equipment, however, and you’ll be hard pressed to properly sear a steak on the gas units they do come with. Charcoal, on the other hand, can burn very hot. By properly managing your coals and adjusting your airflow, you can get some seriously impressive temperatures out of a charcoal grill. You’ll have more than enough heat to produce a mallard reaction and get the edges of your steak just the way you want them. This might seem like a major upside to charcoal. In my experience, however, it’s pretty trivial at best. Most of the time, you’ll want to cook a steak to just under the doneness you want over slow heat then sear it on a completely separate cooking station. This is a fancy way of saying “take it into the kitchen and throw it onto a really hot frying pan.” While you can do both steps over a charcoal grill, you’ll have to remove the steaks, fiddle with the grill to add more oxygen, and then wait for things to heat up. I much prefer simply handing off my steaks to my cooking partner indoors. Charcoal is a lot more difficult to manage than gas when it comes to cooking. 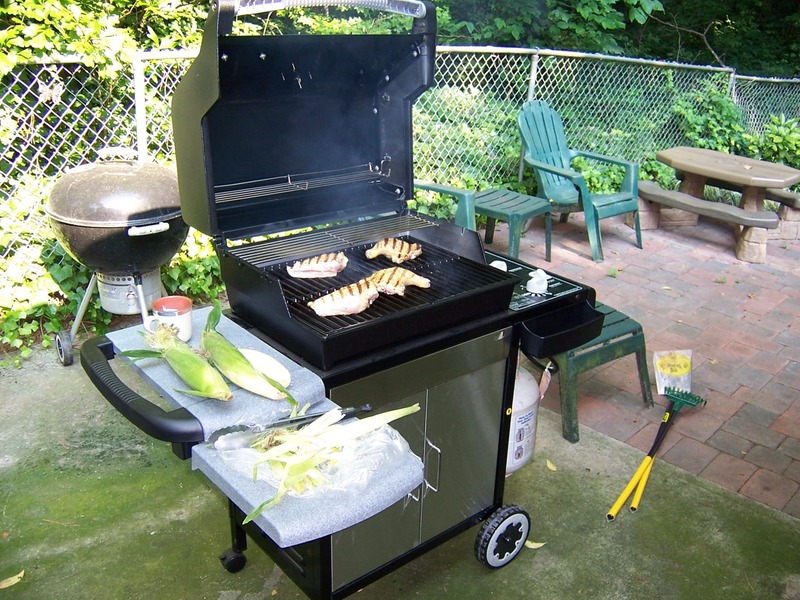 Gas grills come with easy-to-use knobs for adjusting the temperature and automatic igniters. In order to use charcoal, you’ll have to manage the flow of oxygen to your coals and measure temperatures with a grill thermometer. This is after you’ve ignited your coals and waited for them to begin to burn evenly, of course. 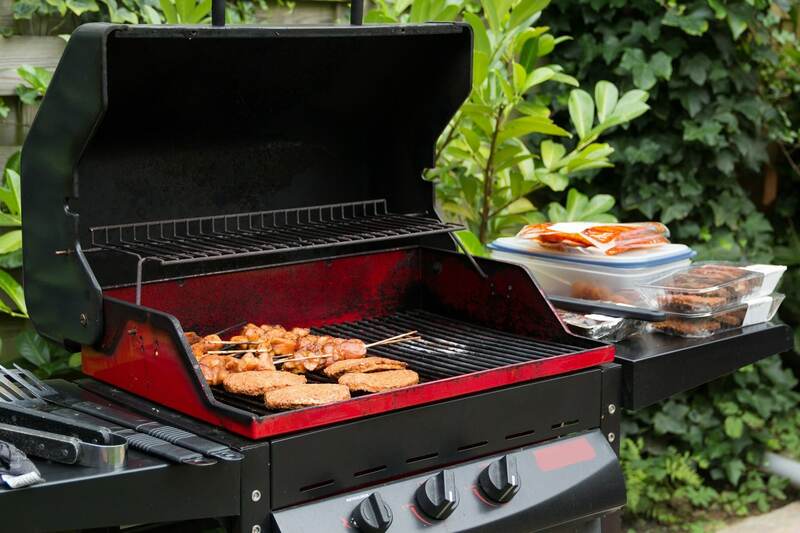 If you don’t already have a chimney starter or you’re not very patient when it comes to cooking, gas grills are a clear winner when it comes to ease of use and time efficiency. There’s certainly something to be said for actually cooking your food over an open flame. The entire experience of cooking with charcoal proves somewhat cathartic to me. The flavor imparted by the coals themselves is unique and somewhat different from the flavors you get from a gas grill. Note that I said different, not better. If you season and cook your meat properly, you’ll get excellent results from both gas and charcoal grills. Should you run a blind taste test, the victims of your experiment will tell you that the results taste pretty different, but they won’t reliably prefer one over the other. The best option? Get both. While charcoal can be a bit of a pain for everyday cooking, it’s great fun for more serious occasions and social events. Gas offers you lots of conveninece for when you’re just cooking a few burgers and don’t want to deal with the extra hassle and time that charcoal requires. Natural hardwood smoke adds a distinctive, complex note to the foods you cook on your grill. 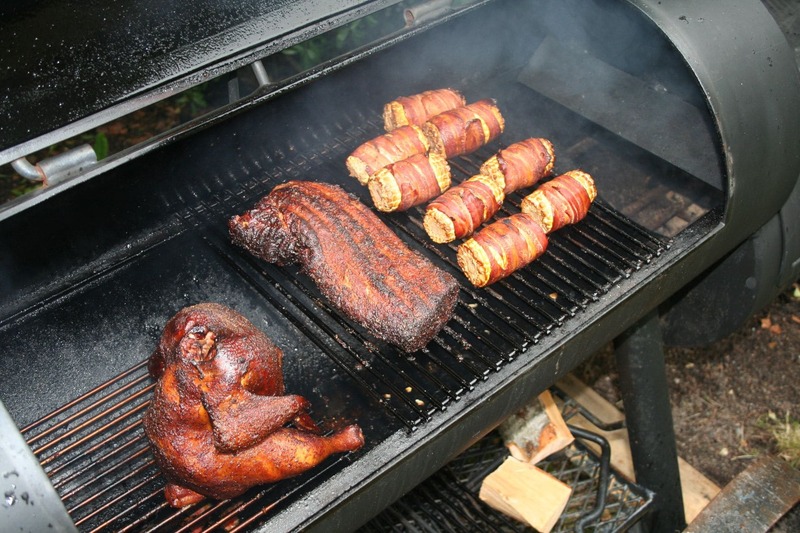 While you can toss a bit of wood or wood pellets down on your gas or charcoal grill to add smoke naturally (or even use liquid smoke), having a smoker box attached to your grill enables you to emulate the results you’d get from a dedicated smoker. You’ll get a rich, deep smoky flavor that will take your barbecue to the next level. If you’re serious about brisket, you want to smoke your own fish at home, or you’ve been eyeing a smoker for a while, a model with a smoker box is probably a good investment. If you haven’t been considering one already, however, they’re not really the best impulse purchases. You’ll need to buy special food-safe hardwood blends to burn, which can get expensive. Just like with a charcoal grill, you’ll have to manage your fire temperature over a long period of time by controlling the availability of fuel and oxygen. That said, when it comes to indirect cooking, smokers are king. You can emulate indirect heat on your grill by pushing all of your coals to one side or only using one set of burners and placing your meat on the other side. Since a smoker box lives outside of the grill entirely, it allows you to apply indirect heat over a much larger area. 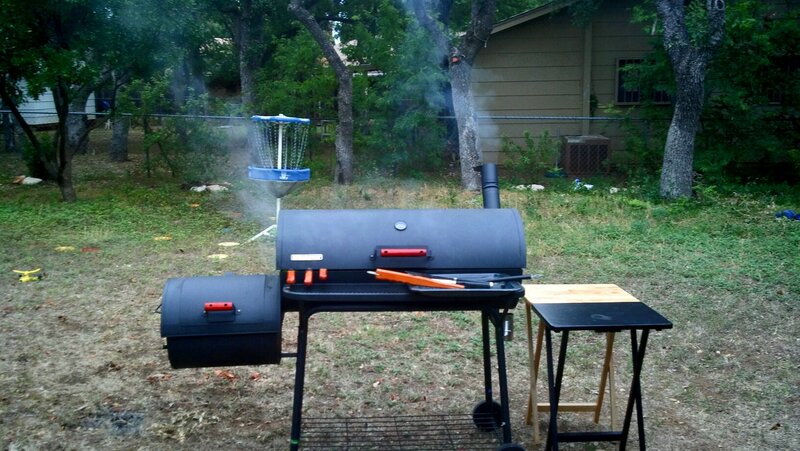 This lets you smoke a lot more meat at once. As I mentioned earlier, it also allows you to imbue your meat with the incredible flavor of natural smoke. 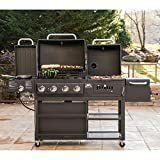 What Combination Grill Models Are Available on the Market? Luckily for us, you can choose more than one of these options. By picking a combination grill, you can have the searing power of charcoal, the slow cooking power of a smoker, and the convenience of gas. These packages are priced pretty affordably, too, considering that they’re literally three cooking instruments in one. The Smoke Hollow 4-in-1 and Char-Griller Trio come with all three options. These units are great for households that take barbecue pretty seriously or for cooks who like to experiment. If you’ve ever wanted to find out which type of cooking is best for preparing your favorite cut of meat, these grills will help you try all three! The Landmann Black Dog 42XT and Medina River Outdoors both feature charcoal grills with side smoker boxes. If you want to take a hands-on approach to cooking and use traditional heat sources, one of these units would be perfect for your backyard. You’ll enjoy your time setting up your grill in order to get rich, smoky flavors from your barbecue! The Char-Griller 5050 offers side-by-side gas and charcoal grills. This is perfect for cooking steaks: you can warm up your charcoal grill to a crazy high temperature while you slow-cook your steaks on the gas side! When your steaks hit the doneness you want, just pop ’em on over to the charcoal grill for a few seconds to sear the edges. This combination is also perfect for people who prefer charcoal but don’t want to deal with the hassle of working with coals every time they want a hot dog. 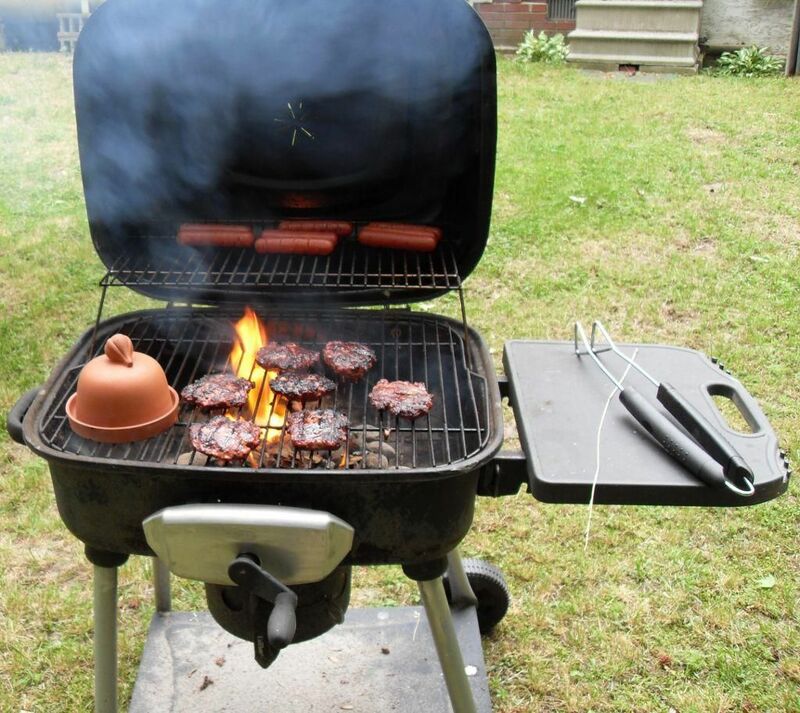 You can use the gas side for simple cooking while still having the charcoal grill for more serious occasions. If you need to convert your grill to use natural gas, the Smoke Hollow 4-in-1 Grill is your best choice. You can convert some of the other models, too, but you’ll void the manufacturer warranty with an aftermarket kit. The Smoke Hollow offers dedicated support for both natural gas and propane (Check out the best propane grills under 200$).